Helsinki, the capital city of Finland, was fortified during the first world war in the years 1914 - 1918. Town was protected against the naval attacks by the coastal artillery batteries which located on the archipelago of Helsinki district. At the mainland areas town was rounded with three consecutive fortress lines. At that time Finland belonged to Russia and fortifications in Helsinki were a part of defending system of Sankt Petersburg, the capital city of Russia. Russian Far East Fleet had been destroyed almost totally at the besiegement of Port Arthur during the Russo-Japanese War (1904-1905). The Baltic Fleet was sent to get back the lost sea supremacy, but the fleet was destroyed in naval battle of Tsushima year 1905. Only some vessels were saved. Meanwhile at the beginning of 20th century German and Swedish naval forces in Baltic were elaborated strongly. Without acceptable fleet, Russians based defense of Sankt Petersburg to coastal fortifications and sea mines. The fortification work started finally in year 1912 after many plans and committee deliberation. In the end of Gulf of Finland locates the Kottlin Island with city of Kronshtadt, which was very important naval base. 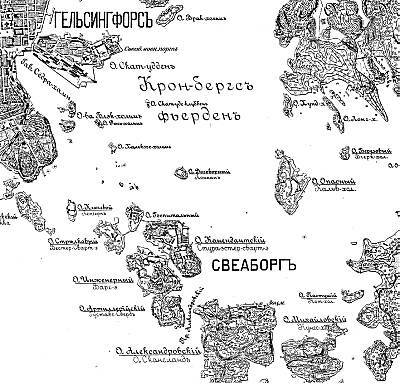 Area around Kronshtadt, including mainland coasts north and south, were strongly fortified. Armament included among other guns also robust 305 millimeters (12") guns. Main defense position, called Peter the Great’s Naval Fortress located at the narrowest point of Gulf of Finland. It included heavy batteries in Estonia coast area in Tallinn district and island of Naissaar (Nargen). In the coast of Finland main defense positions located near cape of Porkkala on the Mäkiluoto (Makilo) Island. There were also other defense positions: In the Northern Baltic area fortified archipelago in the south-west coast of Finland and in Estonia the Hiienmaa (Osel) and Saarenmaa (Dago) district. Helsinki and Tallinn were used as naval bases. Both towns were defended with coastal batteries and fortifications in mainland fronts. Also the city of Viipuri in the end of Gulf of Finland was protected with mainland fortifications. Sea areas in the northern Baltic and in entrance to Gulf of Finland, were mined. In year 1915 batteries were also built on Åland. Island group of Åland was defined as demilitarized area in year 1856, after the Crimean war. Coastal batteries and firing sectors in northern Baltic and Gulf of Finland in the end of the war 1918. Look also: Interactive map of coastal fortifications. In the middle of 1700's when Finland was part of Sweden, the fortress of Sveaborg (or Viapori as Finns called it) was built on the six small islands outside of Helsinki by Swedish army to protect the important naval base. Sveaborg surrendered to Russians in year 1808 and Finland was made a part of Russia next year. During the following decades fortress was developed to modern naval fortress. The fortress expanded from the main islands of Sveaborg to several islands of Helsinki district. At the First world war Sveaborg still defended the naval port of Helsinki. At the outbreak of war, year 1914, there was hurry to finish the already started fortification work on the islands. There were also some new battery building sites. New concrete batteries were finished rapidly and got the proper armament. Building of field fortifications were started on the hills around the city. Fortification line’s range was approximately 7 kilometers from the naval port. It was found to be too short distance. There was a fear that enemy army could fire the harbor in siege like in Port Arthur ten years earlier. At the end of the first year of war, Gulf of Finland was so strongly fortified and mined that it was improbable that Germans landed near Sankt Petersburg. It was supposed that German forces would land at the Gulf of Bothnia in the west coast of Finland. Fortifications were built in the main traffic junctions of southern Finland. The idea was that defending army could withdraw with delay to south-east Finland and wait help from Russia. In this kind of situation it would be very important to keep Helsinki in defenders possession. The land front was enlarged. The new fortification line was 10 kilometers distance from main islands of Sveaborg and the harbor. Also the third fortification line at the north and east side of the city was built during the war. Working pace of the fortification got slower after the revolution in Russia in march 1917. Finland gave declaration of independence 6.12.1917. However working in mainland front still continued till beginning of the year 1918.